Great Britain warns Germany it cannot remain neutral. Austrians bombard Serbian capital Belgrade. German patrols cross the French border. Prize Day at most of Newark’s elementary schools. At Holy Trinity, nobody makes anything of the fact that all but two of the prize winners are girls: Rose Dunlop, Ivy Thrale, Harriet Bowers, Ada Lowe, Janie Graham, Doris Jessop, Connie Bedford, Dora McGuire and Maggie Tourney. The prize-boys are George Jessop and Cyril Bowers. One of the Belgian refugees, Mademoiselle Marthe Rumes, only 21, is a newly-appointed teacher at Holy Trinity Roman Catholic School. It is little wonder she speaks near-perfect English: she studied to be a teacher in Sussex only a few years ago. Now she tells of brutalities on the continent – and reveals how she had to lie to escape the Germans in Belgium. While she was living in Ghent, a male acquaintance was taken by the Germans and ordered to bury their dead. “This drove him mad because he was told to bury them alive if he thought they had no chance of getting better. Another man had to drive two Germans to Dixmude [also known as Diksmude] and for three hours was riding in between dead bodies and over them when he could not drive between them.” As she had been born in Holland, she holds a Dutch passport – and, desperate to escape the atrocities, she assured the Germans that she wished to visit relatives in Holland, although all her known relations live in Belgium. They eventually believed her and allowed her to cross the border, whence she caught a boat to Folkestone and then swiftly sought a job. Dixmude will eventually ensure nobody would forget its experiences of 1914-18 by creating ‘The Trench of Death’ as part of the region’s memorials to the thousands of men who were never able to go home. 25 August 1915 Private 7028 Thomas Tournay, 34, 2nd Sherwoods Youngest son of Mrs E.J. Tournay, 45 Barnbygate, Newark. As a boy educated at the Catholic school and after working for a time he joined the army, his first regiment being the Lincolnshire Militia, which he joined prepatory to joining a line regiment. Afterwards transferring to the 1st Sherwood Foresters and with them saw over eight years foreign service, including India, Singapore, Hong Kong, Pekin etc. after his return home being on the Reserve. 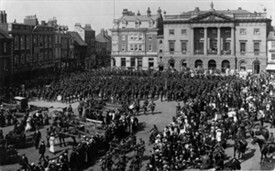 On resuming civil life he was appointed a postman at Worksop from where he was called to his regiment on the outbreak of hostilities. Proceeding to Derby and thence to Plymouth, crossing over to France on Nov. 12th. Killed by a German sniper while on fatigue duty. He is remembered in the Potijze Burial Ground Cemetery. He was engaged to Miss Elvidge of Ollerton Road, Retford and was contemplating getting married during his next leave. Edith Alice Elvidge, 31-year-old cook at Winthorpe Grange who is busy planning for her wedding when her fiancé gets home on leave any day now, hears that he is dead. Pte Thomas Tournay, 34, the youngest son of Mrs Elizabeth Tournay of 45 Barnbygate, was killed by a sniper in France on 25 August while on fatigue duty. A former pupil at Newark Catholic School, he was a career soldier first in the Lincoln Militia and then the Sherwoods, in India, Singapore, Hong Kong and Pekin (sic) among other exotic situations. After leaving the Army he was a postman at Worksop, but was recalled on the outbreak of War. He has been in France since 12 November and his letters home have always been cheerful. In his latest, he marvelled that he had emerged through so much brutality without a scratch and said he looked forward to getting home on leave soon to marry his sweetheart. Instead this brave Tommy is buried in the village cemetery at Potijze near Ypres. Charles Robinson of 178 Barnbygate – a footballer of considerable merit in Newark Town’s team in the Midland League a few years ago and now a corporal in the Royal Field Artillery – has distinguished himself on the field of battle. He has been presented with a card headed “For gallant and meritorious service” and inscribed: “The Major-General Commanding has noted with pleasure the gallant and meritorious conduct of No. 99881 Corporal C Robinson between May 1915 and February 1916, which has been brought to his attention by his Commanding Officer.” It is signed by Maj-Gen V Couper, Commanding 14th Light Division, British Army in the Field. The gallant corporal gained the commendation for his signalling work. In a letter home, Charles explains that the award was earned “during the scraps, one in which I was on duty with the infantry, the first time for keeping communications, and the second for getting a flag message through to my battery when all wires had been broken, the enemy being successfully countered. The officer under whose charge I was has already been decorated with the Military Cross. We had never tried to send a visual message before. We should have been stopped at any ordinary time, but things were hot at the time and I suppose the enemy were too busy elsewhere. Fortunately for us, my own Officer Commanding saw the signal, and he was the only one who spotted it. We sent ‘SOS’ first and then ran back into cover after we had repeated it several times. The officer then brought a message and we sent it several times. Imagine my joy, and also the officers and the other signallers, who had also sent the message, when an orderly came along and said the Captain had received my message. The Officer Commanding another battery stopped and complimented me on my work during the scrap. He said my flag message was great.” Charles, who went to Holy Trinity School and was an altar- and choirboy at the Catholic Church, worked for Abbott’s before joining up. Newark Education Authority allocates allotments in Lime Grove to boys from the Wesleyan School and Christ Church School, while a garden in Boundary Lane has been placed at the disposal of Holy Trinity School. This page was added by Website Administrator on 21/10/2014.